Aug. 10 (Bloomberg) — Damaged crops from India to Brazil mean the world won’t have enough sugar for a second straight year. Global demand will exceed output by as much as 5 million metric tons in the year through September 2010, leading to a record two-year shortfall, according to the International Sugar Organization in London. Parts of Brazil, the largest grower, are drenched by rainfall four times more than normal and too wet to harvest. India, the biggest consumer, had its driest June in 83 years and may double imports. The number of options to buy sugar for delivery in March at 30 cents a pound, 44 percent higher than the Aug. 7 price in New York, has jumped more than 18-fold in four months. The rally is boosting expenses for food makers from Kellogg Co. to Kraft Foods Inc. and increasing profits for Cosan SA Industria e Comercio, the largest cane processor. Hedge funds and other large speculators more than doubled net-long positions, or bets prices will rise, to 206,330 contracts this year, the most since a record 240,792 in January 2008, U.S. Commodity Futures Trading Commission data show. Sugar surged 76 percent this year, reaching 20.85 cents a pound last week, the highest since April 1981. Bajaj Hindusthan Ltd., India’s biggest producer, predicts it may reach 25 cents by yearend, and Mizuho Corporate Bank Ltd. estimates 30 cents. The number of 40-cent call options for March 2010 has quintupled to 18,800 contracts in the past four months. A call contract gives the holder the right but not the obligation to purchase a commodity at a given price by a specific date. Global use may rise 1.3 percent to 161 million tons in the 2009-2010 marketing year, surpassing production of 156.9 million tons and draining inventories, according to Macquarie Bank Ltd. in London. Almost four decades ago, the commodity rose 16-fold over five years and reached a record 66 cents in November 1974. That year, global stockpiles fell to a 10-year low. Since then, world production doubled before the recent supply squeeze. Oil’s 59 percent gain this year to $70.93 a barrel increased the value of ethanol made from sugar cane, and a 2.9 percent drop in the dollar against six major currencies spurred demand for commodities as hedges against inflation. India will be a net importer for a second straight year, U.S. Department of Agriculture data show. This year, output has dropped in Thailand, the second-largest exporter after Brazil, and in China and the European Union. Mexico, normally the biggest exporter to the U.S., set an import quota of 393,000 tons until December after the industry forecast an 11 percent drop in the harvest to 4.9 million tons. In the U.S., consumption will total 11 million short tons (9.98 million metric tons) this year, as farmers produce 7.47 million, the government estimates. The ratio of inventories to total use in the year that ends Sept. 30 will drop to 11 percent, the lowest since 1975, USDA data show. Food companies including Northfield, Illinois-based Kraft, General Mills Inc. in Minneapolis and Omaha, Nebraska-based ConAgra Foods Inc. asked the USDA Aug. 7 to raise import quotas. Enthusiasm may fizzle as rising food costs and the first global recession since World War II reduce demand for sweets. The commodity also may fall should crops in India and Brazil exceed estimates. The market also may “come off very quickly” if the dollar strengthens, said Nick Hungate, a senior trader for Rabobank International in London. The U.S. Dollar Index, which measures its performance against the euro, yen, pound, Canadian dollar, Swedish krona and Swiss franc, reached the lowest level since September on Aug. 5. At 18 cents a pound or more, consumption will slow, said Jonathan Kingsman, the chairman of broker and researcher Kingsman SA in Lausanne, Switzerland. India’s consumption fell 2.3 percent to 23 million tons this year from the 2007-2008 marketing year and demand will be little changed next year, the USDA estimates. Transactions in Brazil indicate supplies are adequate, said Mario Silveira, a senior risk management consultant for FCStone Group Inc.’s unit in Campinas. Shipments from Port Santos were 0.9 cent a pound less than futures on Aug. 5, about the same as a year earlier, he said. “It does not tell us we have a supply crisis in the Brazilian market,” Silveira said. Analysts say India may have little choice but to buy international supplies, even at the higher cost. India’s inventories will fall 50 percent to 4.54 million tons this year, equal to less than three months of consumption, USDA data show. Output fell 48 percent to 14.7 million tons in the 2008- 2009 marketing year, less than consumption of 23.2 million tons, Macquarie said. Farmers reduced planting after the government raised the minimum price for crops such as wheat. This season a below-average monsoon, the main source of irrigation for India’s 235 million farmers, may hinder a rebound. The government of Uttar Pradesh, the second-largest producing state, declared drought in 47 of its 70 districts. 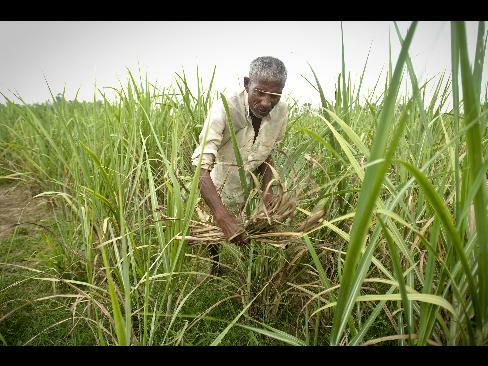 Maharashtra, the largest maker of the sweetener, reduced forecasts to 4.6 million tons in the year starting Oct. 1 from 5 million in June. The plants on Birbal Singh’s one-acre farm in the Moradabad district of Uttar Pradesh are about one foot high (30 centimeters), compared with the normal five feet at this time of year. Singh, 50, said he can only afford to irrigate his rice and not sugar cane because of the cost of diesel fuel needed to run the pump. “Farmers have applied fertilizers and other nutrients in fields and the color of the crop is good, but there’s no growth,” said Subhash Pandey, 55, the vice president in charge of a Dhampur Sugar Mills Ltd. factory in Moradabad that is supplied by 40,000 growers. Rainfall in the country was 64 percent below normal in the week ended Aug. 5, the India Meteorological Department said. Rain may reach some drought-struck regions in the next few days, the bureau said today. Cane plants were sown on 4.25 million hectares (10.5 million acres) as of July 30, down from 4.38 million a year earlier, the government said July 31, and duty-free imports were extended. Production may reach 15 million tons in the 2009-2010 marketing year, with imports of 4 million tons to 5 million tons, up from 2.5 million this year, said Laetitia Lacourte, a broker in London for Fortis Bank. “Everyone is focused on India and Brazil,” Lacourte said. Record supplies from Brazil had been expected to help fill the gap left by India until rainfall disrupted field work. Growers halted cutting during recent weeks in the Center South, because trucks and tractors can’t get into wet fields. The moisture is leaching sucrose from plants. Last month, most fields in Sao Paulo state got two to four times the normal amount of rain, said Drew Lerner, president of World Weather Inc. in Overland Park, Kansas. Center-South farmers collected 33.5 million tons in the two weeks through July 16, down from 35.1 million a year earlier, according to Unica, an industry association. The region’s crop this year may yield the equivalent of 550,000 to 700,000 tons less sugar than forecast, the group said. Food companies are being squeezed by the commodity’s gains and passing along the costs to consumers. Battle Creek, Michigan-based Kellogg, the maker of Froot Loops and Rice Krispies cereals, raised prices in January partly because of increased spending on sugar. Kraft, the world’s second-largest food maker, said commodity costs rose about $420 million for the six months ended June 30 when compared with a year earlier. Grain, oil, cocoa and sugar accounted for the majority of the increase, according to an Aug. 5 company filing. The rally may boost profits at Piracicaba, Brazil-based Cosan. The shares have gained 59 percent this year to 17.90 reais ($9.83) in Sao Paulo on Aug. 7, earlier touching the highest level since September. To contact the reporters on this story: Shruti Date Singh in Chicago at ssingh28@bloomberg.net; Claudia Carpenter in London at ccarpenter2@bloomberg.net; Pratik Parija in New Delhi at pparija@bloomberg.net.